This article is about the song. For other uses, see Islands in the Stream. "You Were a Good Friend"
(1983) "Islands in the Stream"
(1983) "Save the Last Dance for Me"
"Islands in the Stream" is a song written by the Bee Gees and sung by American country music artists Kenny Rogers and Dolly Parton. Named after the Ernest Hemingway novel, it was originally written for Marvin Gaye in an R&B style, only later to be changed for the Kenny Rogers album. It was released in August 1983 as the first single from Rogers' album Eyes That See in the Dark. The song reached number one on the Billboard Hot 100 chart in the United States, giving both Rogers and Parton their second pop number-one hit (after Rogers' "Lady" in 1980 and Parton's "9 to 5" in 1981). It also topped the Country and Adult Contemporary charts. It has been certified Platinum by the Recording Industry Association of America for selling over two million physical copies in the US. In 2005 the song topped CMT's poll of the best country duets of all time; Parton and Rogers reunited to perform the song on the CMT special. Rogers and Parton went on to record a Christmas album together, and had an additional hit with their 1985 duet "Real Love". The song is sung in C major moderate 4/4 time, with Rogers and Parton alternating lead vocals, and in two-part harmony. Their version features a key change from C major to A-flat major. By contrast the Bee Gees' recorded version has no key change, and is sung throughout as a solo lead vocal with three-part harmony on the final chorus. In both versions the chorus is syncopated, with the phrase starting one quaver (eighth note) before the 4th beat of the bar. It knocked Bonnie Tyler's "Total Eclipse of the Heart" out of No. 1 on Billboard's Hot 100, also topping the Country and Adult Contemporary listings. In December of that year it was certified Platinum by the Recording Industry Association of America for selling over two million physical copies in the US. It has also sold 569,000 digital copies in the US as of November 2013. While the song was at the very top of the country charts, another of Rogers' singles "Scarlet Fever" reached #5. In Australia the song was number one for one week in December 1983 and became one of the highest selling singles of 1984. The song reached a peak of No. 7 in the UK singles chart in 1983. Since then it has also sold 245,577 digital copies in the UK as of July 2014. In April 2008 South Bend, Indiana, radio station WZOW played the song continuously for several days on end, a stunt drawing attention to the station's format change from alternative rock to adult contemporary. In September 2016, in Supergirl (TV Serie), the song was played at the alien bar in the episode "Welcome to Earth". "One of a Kind Pair of Fools"
Danish blues-rock singer Peter Thorup and pop singer Anne Grete Rendtorff had great success with a version with Danish lyrics in 1984 callet Skibe uden Sejl (Ships without Sailcloth). The song was used as title track for the Danish TV series Måske i morgen (maybe tomorrow) shown on Danish national television DR.
Swedish pop and country singer Kikki Danielsson covered the song on her 1983 album Singles Bar, with lyrics in Swedish by Ingela "Pling" Forsman as "Öar i ett hav" ("Islands in a sea"). Canadian vocalist Leslie Feist recorded a version of this song with her friends the Constantines. It appeared as number 9 on the bonus disc in the Deluxe Edition of The Reminder. In 1994 the majorcan singer Tomeu Penya recorded a version of this song with lyrics in a Balearic dialect of catalan, entitled Illes dins un riu (Islands in a stream) in the album Una Aclucada d'ull. This version was a duet sung with Adriana Ceballos an argentinian singer, this song became very popular in Catalonia. In the US television series The Office, Michael Scott performs a karaoke version of the song in the "E-mail Surveillance" episode. While waiting for someone to join him for the duet, Michael awkwardly finds himself singing the female part in falsetto until he is finally joined by the Jim Halpert character. It is the opening track of Barry Manilow's 2007 album The Greatest Songs of the Eighties, sung with Reba McEntire. My Morning Jacket covered "Islands in the Stream" in the encore of their August 12, 2011 concert at Merriweather Post Pavilion in Columbia, Maryland. The song featured Neko Case, who performed as the opening act earlier in the evening. The chorus of the hip-hop song "Ghetto Supastar (That Is What You Are)" is an interpolation of the chorus of "Islands in the Stream". The song was covered by the characters Vanessa Jenkins (Ruth Jones) and Bryn West (Rob Brydon) on an episode of the UK television series Gavin & Stacey. It was reprised by the same characters in a 2009 Comic Relief sketch, which also featured Tom Jones. The song was covered by South African singers, the 2nd runner-up of South African Idols Melanie Lowe, and Garth Taylor. Their cover became a local radio hit. In 2009 Namibian singer Nianell and South African singer Dozi released a version on their album It Takes Two. In 2010 South African, Afrikaans singers Ray Dylan and Elizma Theron covered the song. In 2010 Irish singer Ronan Keating covered the song together with Australian country music trio The McClymonts for his album Duet. In 2012 Frankie and Tonicha Quinnell covered the song on Frankie's debut album Imagine Me. In 2014 Tzvi Hersh and Yehoshua Roysman covered the song on their debut album Red Badge of Honor. A portion of the song was covered by James Stinson (Wayne Brady) in the first episode of How I Met Your Mother's ninth season, "The Locket". (10) "Islands in the Stream"
The Bee Gees recorded a new version for their retrospective 2001 compilation Their Greatest Hits: The Record, with solo vocal by Robin Gibb; it also appeared on their 2004 Number Ones and on the 2010 Mythology box set. The chorus of Pras' 1998 hit "Ghetto Supastar (That Is What You Are)", which in turn is a reworking of the original Rogers and Parton release, replaces the final chorus in the studio recording. The Bee Gees "live" version of the song appears on their One Night Only album as well as the compilation Love Songs. (3) "Islands in the Stream"
Barry Gibb's demo for Kenny Rogers had previously been bootlegged but was officially released in November 2006. It features Barry Gibb on solo vocal, with 3-part harmony on the chorus. "(Barry) Islands in the Stream"
(2007) "(Barry) Islands in the Stream"
(2009) "I've Gotta Get a Message to You"
(2006) "(Barry) Islands in the Stream"
On March 8, 2009, actors Ruth Jones and Rob Brydon, in character as Vanessa Jenkins and Bryn West from the hit BBC sitcom Gavin & Stacey, released a version of the song as a single for Comic Relief. Sir Tom Jones also features on the song, performing the final verse and chorus, whilst Robin Gibb appears on the single as a backing vocalist. Re-titled "(Barry) Islands in the Stream", in reference to the Barry Island setting of Gavin & Stacey, it entered the UK Singles Chart at no. 1 on March 15, 2009. By peaking at no. 1, this meant the Gibb Brothers had achieved number 1 songs in five successive decades, the first songwriters to achieve this feat. It also made Sir Tom Jones, at the age of 68, the oldest person to have a UK number one. The video was filmed in Barry Island, Las Vegas and the Nevada desert, with both Gibb and Jones appearing in the video alongside Jones and Brydon. Nigel Lythgoe also makes a cameo appearance as a talent competition judge. ↑ Bjorke, Matt (November 13, 2013). "Country Chart News – The Top 30 Digital Singles – November 13, 2013: CMA Awards Drive Sales; Eric Church "The Outsiders" #1; Taylor Swift "Red" #3". Roughstock. Archived from the original on April 21, 2014. ↑ :Indiana Aiwaves: Archived July 13, 2011, at the Wayback Machine. ↑ "Austriancharts.at – Kenny Rogers & Dolly Parton – Islands in the Stream" (in German). Ö3 Austria Top 40. ↑ "Musicline.de – Kenny Rogers & Dolly Parton Single-Chartverfolgung" (in German). Media Control Charts. PhonoNet GmbH. ↑ "Nederlandse Top 40 – Kenny Rogers & Dolly Parton search results" (in Dutch) Dutch Top 40. ↑ "Charts.org.nz – Kenny Rogers & Dolly Parton – Islands in the Stream". Top 40 Singles. 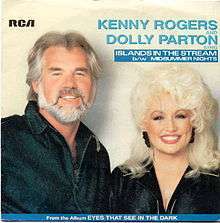 ↑ "Norwegiancharts.com – Kenny Rogers & Dolly Parton – Islands in the Stream". VG-lista. ↑ "Swedishcharts.com – Kenny Rogers & Dolly Parton – Islands in the Stream". Singles Top 100. ↑ "Swisscharts.com – Kenny Rogers & Dolly Parton – Islands in the Stream". Swiss Singles Chart. ↑ David Kent's "Australian Chart Book 1970-1992" Archived March 5, 2016, at the Wayback Machine. ↑ "Archived copy". Archived from the original on December 29, 2013. Retrieved 2015-05-09. ↑ "It Takes Two – Nianell & Dozi". Retrieved January 7, 2014.